Home » Service Manual Catalog » EPSON Adjustment Programs » InkJet printers » AP_L805 I have paid for Reset Key but not received yet. Epson L805 (ECC) Ver.1.0.0 Service Adjustment Program New! The Epson Adjustment Program for New models Epson L805 can be used under Windows only (Millenium, 2000, XP, Vista, 7, 8, 10 [in compatibility mode]). 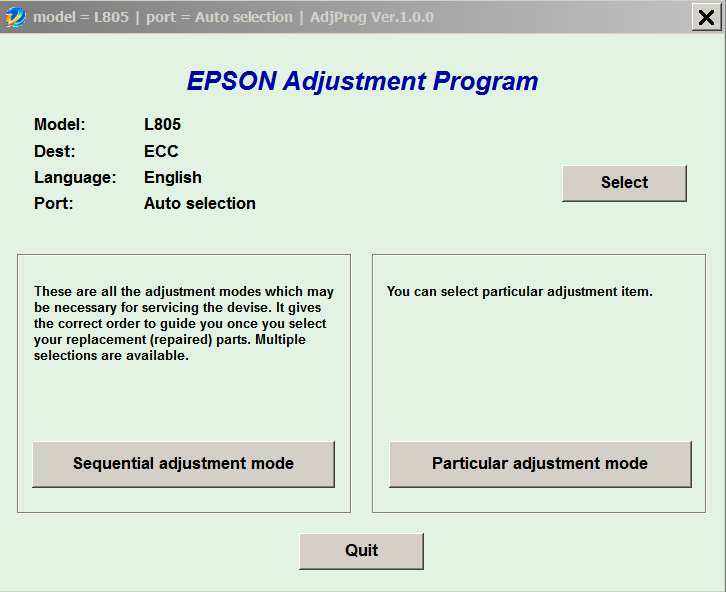 We recommend reading the Epson L805 Service Manual before using the adjustment utility. Its great! It saves a lot of money to be spent in vain. I tried from various service centres, but nobody guided me properly by using ur software and reset key, it takes hardly 5 minutes to complete all the procedure. Artisan 710 running again and saved a lot of money. Thanks a lot! Notify me of updates to Epson L805 (ECC) Ver.1.0.0 Service Adjustment Program New!